Bat Cave is one of the most scenic vacation destinations and it's all at your doorstep when you stay at our river cottages. 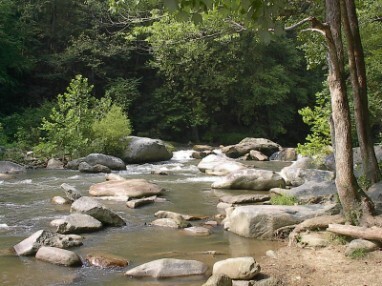 Our cottages are located right where the Rocky Broad River and Reedy Creek boldly flows together and just perfect for spending a lazy afternoon. You will find magnificent views in a relaxing and comfortable atmosphere at our cottages. Imagine sitting on the deck and hearing the river flow rapidly over the rocks and boulders while reading your favorite book or enjoying fishing right down from your deck. At night, relax with a beverage in the hot tub which is right on your deck while enjoying the peaceful sounds of the river below. The cottages are located near distinctive Chimney Rock and Lake Lure that provides shopping, hiking and wide range of activities that all ages can enjoy. 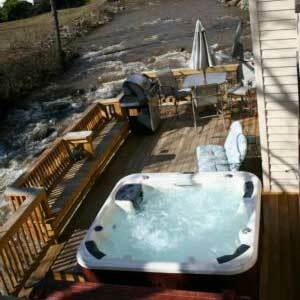 Enjoy a Fun Filled Vacation at one of the Most Scenic Areas in North Carolina. 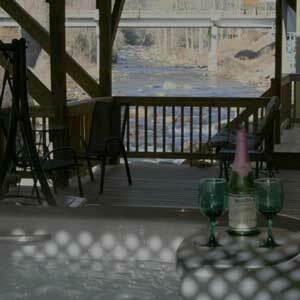 Relax on your own deck overlooking the Rocky Broad River. 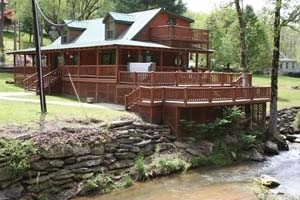 Log cabin home on a bold creek. Wood flooring, ceilings and walls, fireplace in the living room, well equipped kitchen with kitchen breakfast bar, Jenn-air range & cook top. Main level master bedroom with jet tub that opens to deck. Upper level features 2nd bedroom suite with full bath that also opens to deck and loft area. Cabin has wrap around covered porches. Only minutes to historic Chimney Rock and Lake Lure.